There is nothing better than a cool crisp White Wine after a long hot day. But there is more to White Wine than just a refreshing drink. With Sparkling Wine there is Pinot Noir & Chardonnay, Moscato & Prosecco just to name a few. 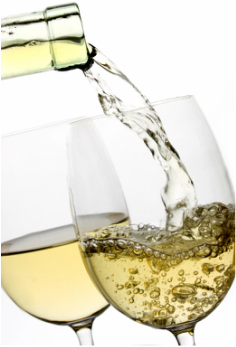 In Aromatic Whites there is Riesling, Pinot Gris or Grigio, Gewurztraminer, Sauvignon Blanc & Gruner Veltliner. For a little more body we have Verdelho, Albarino, Marsanne, Rousanne, Viognier and Vermentino. What about Fiano Arneis and of course Chardonnay & Semillon. All these varieties can also be made into the Driest of Wines and the Sweetest Dessert Wines. Come along to this Masterclass and learn all About White Wine, where it comes from and which are the best ones. This class will include 16 White Wines from Australia, Europe and New Zealand. If you are a White Wine drinker this is all you ever wanted to know about White Wine, which one goes best with Food and what wines to Cellar. Call today for a Gift Certificate & Book your place as numbers are limited. The evening will include Bread & Dip with the first Bracket of 17 Wines followed by a well matched Main Course with the Third Bracket of Wines.